This weekend’s FedHealth XTERRA South Africa Championship, the first of 41 events in 33 countries on the XWC qualifying series schedule, will host some 2,000 racers at the Grabouw Country Club in the Western Cape including Olympians Richard Murray and Flora Duffy. February 21, 2017 (Honolulu, HI) – This weekend’s FedHealth XTERRA South Africa Championship, the first of 41 events in 33 countries on the XWC qualifying series schedule, will host some 2,000 racers at the Grabouw Country Club in the Western Cape including Olympians Richard Murray and Flora Duffy. Elites in the men’s race include home country heroes Bradley Weiss, the reigning XTERRA SA and Philippines Champion; Richard Murray, who finished 4th at last summer’s Olympic triathlon event in Rio; Stuart Marais – the 2015 SA Champ; and Theo Blignaut. Three of the top 10 men in last year’s XTERRA European Tour are also on the start list including Kris Coddens, an XTERRA champion from Belgium; Brice Daubord from France, and Jan Pyott of Switzerland. For Murray, XTERRA provides an opportunity to mix up his arduous triathlon training and racing routine. Marais, who missed last year’s race in Grabouw due to illness, said he is looking forward to some hard off-road racing. “With XTERRA Grabouw attracting the cream of SA triathlon, there are a number of athletes who will be able to challenge for the overall win. The number of international athletes entered is testimony to the quality of the event that is hosted by Stillwater Sports. It’s great to have strong competition. Hopefully I will be up to the challenge,” said Marais. 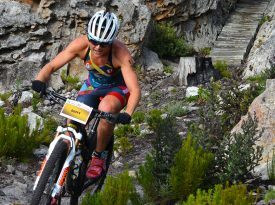 In the women’s race, reigning and three-time Olympian, XTERRA SA and World Champion Flora Duffy is looking to make it four-in-a-row at her home away from home. Other elite women hoping to throw a spanner in the works include Carina Wasle (Austria), Rachel Klamer (Netherlands), and Sandra Koblmueller (Austria). In addition to the main event XTERRA South Africa hosts a kids tri, sprint tri, and trail runs that accommodate thousands of racers over the three days in Grabouw. This is the 14th year for XTERRA in South Africa, but even for seasoned veterans it will look like a brand new venue this time. The fastest age groupers in the championship race earn qualifying spots into the ITU and XTERRA World Championship races while elites race for their share of the 154,000 rand prize purse. For further information visit www.stillwatersports.com or follow along on Facebook at https://www.facebook.com/XTERRASouthAfrica.